Remembered by most for a string of mostly quite successful singles, The Turtles actually recorded not only some of the best folk rock ever but also some very tasty psychedelic and heavy rock. Manifesto Records’ new 6 disc, 141 track box set documenting the entire musical journey of The Turtles on LP will be released on August 19th, containing all of the band’s albums in stereo, the first three also in mono, and supplemented with lots of rarities and previously unreleased material. The band’s musical history is completed by Manifesto’s accompanying new 2 disc, 48 track “All The Singles” collection, which will be reviewed separately. The Turtles’ debut album “It Ain’t Me Babe” released in 1965 is one of the period’s best folk rock albums, comparable to bands such as The Byrds and Love. Thanks to compiler Bill Inglot the LP’s twelve tracks are presented here in both mono and stereo mixes. From the opening of the album’s Bob Dylan penned title track, the mono mixes consistently outshine their stereo counterparts, at least to my ears. The album is a mix of band originals and covers, three Dylan tunes among them. However, the highlight for me is the band’s take on P.F. Sloan’s classic “Eve Of Destruction” a huge hit for Barry McGuire. There are lots of jangling guitars and gorgeous vocals throughout. The band’s second album was named for a P.F. Sloan/Steve Barri tune “You Baby” covered on the LP. Unlike its predecessor, “Let Me Be” opens with a band original, “Flyin’ High” penned by lead guitarist Al Nichol, that has lots of punch and is an indication of the group’s growth musically. The album rocks harder than its predecessor with Nichol’s guitar becoming increasingly prominent in the band’s sound. Presented in mono and stereo versions, the mono mixes once again shine in comparison. There are more band originals, with vocalist Howard Kaylan contributing three, bassist Chuck Portz and rhythm guitarist Jim Tucker penning “I Need Someone” as well as the previously mentioned track by Nichol, the highlight of the album for me. The third album, named for the Gary Bonner/Alan Gordon composed smash hit “Happy Together” marked a major change in the band with John Barbata replacing original drummer Don Murray. Barbata’s steady, driving beat became a major part of the group’s sound. 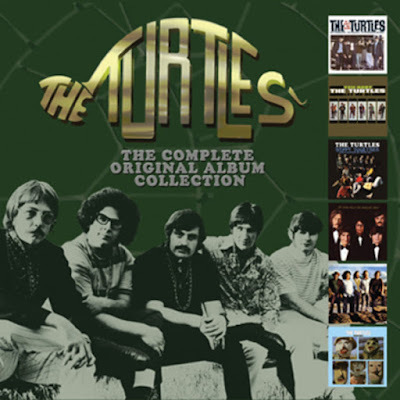 The movie title track “Guide For The Married Man” showcases The Turtles’ ability to mix a pounding beat, gorgeous vocals and a wry sense of humor. “Happy Together” was the last long player by the band released in mono as the music industry and recording techniques shifted to stereo only mixes on LPs, although some singles continued to be released in mono versions for AM radio. Aided by the inclusion of the infectious “She’d Rather Be With Me” this was far and away the band’s best selling album, reaching #25 on the Billboard charts, their only LP besides “It Ain’t Me Babe” to make the top 100, the latter topping at #98. “Battle Of The Bands” is an incredible documentation of The Turtles’ versatility as the group worked through as many types of music as possible on the LP. Producer Chip Douglas, hot off his work with The Monkees, helped the band shape this classic album, which unfortunately did not fare as well commercially as its predecessor despite the inclusion of the hit “Elenore” and the group’s incredible cover of The Byrds’ “You Showed Me.” The band goes back to its surf roots on “Surfer Dan” while “The Last Thing I Remember” is an early trip into psychedelic rock. Another standout is the r and b stomper “Buzz Saw” with fuzzed out guitar by Nichol, who also contributes tasty organ. Joining the album’s twelve tracks are a dozen bonus tracks. Among these are three exquisite psychedelic tunes, “The Last Thing I Remember (The First Thing I Knew),” “The Owl” and “To The Sun.” The tracks are proof positive that The Turtles who now featured a rhythm section of bassist Jim Pons and drummer John Barbata, were quite capable of heavy psych with Nichol’s guitar leading the way. “Turtle Soup” produced by The Kinks’ Ray Davies and released in late 1969 was The Turtles most consistent album and their only LP to feature only original songs. From the snappy opening track “Come Over” to the melodious closer “You Don’t Have To Walk In The Rain” the album offers strong material throughout. The tunes ranged from The Byrds like folk rocker “How You Love Me” to Nichol’s straight out rocker “In The City.” The album’s original twelve tracks are supplemented by an equal number of bonus tracks, among them six tracks intended for a sixth studio album “Shell Shock” produced by Jerry Yester. These tunes find The Turtles going heavy on numbers such as “Goodbye Surprise” featuring inspired guitar work by Nichol and the snappy “If I Only Had The Time” with Pons and Barbata pushing the beat. One can only wonder what would have happened if the sessions had been completed, as financial problems at White Whale Records sadly shut them down. The Turtles’ last album “Wooden Head” was comprised of recordings from 1966 with producer Bones Howe at the helm. Opening with the rocker “I Can’t Stop” led by Nichol’s guitar, the LP is a trip back in time to the band’s earlier folk rock sound. Nichol is featured on electric sitar on the Eastern influenced “She’ll Come Back” written by Howard Kaylan. Thirteen bonus tracks join the album’s original eleven tunes. Among these are 1967 stereo mixes of “You Baby” “Let It Be” and “It Ain’t Me Babe.” “Wooden Head” marked the end of the road for White Whale Records and in turn The Turtles. One can only wonder what the band’s fate would have been if they had been on a bigger label. Compiled by Bill Inglot, who produced the box set with Dan Perloff, and remastered the sound with Dave Schultz at d2 Mastering, this is unquestionably the definitive Turtles album collection. The discs are housed in gatefold mini-LP sleeves and the set includes a 36 page color booklet with complete track listings, an essay by Andrew Sandoval and lots of gorgeous photos. This collection is an absolute must for fans of folk rock, pop rock and psychedelic rock. With this and “All The Singles” you will have everything The Turtles ever released and then some! To preorder “The Complete Original Album Collection” follow this link.